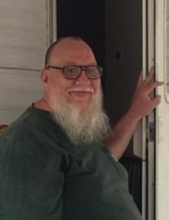 Age 58 of Owosso passed away Saturday, February 2, 2019. Per James' wishes, cremation has taken place and memorial services will be held at a later date. James was born November 25, 1960 in Owosso; the son of Obert VanOver and Helen (Hazel) Vsetula. He graduated from Owosso High School; Class of 1979 and married Trudy Burtch in West Branch on September 1, 2001. James was an avid outdoorsman, he enjoyed small game and waterfowl hunting and fishing with dear friends and family. He loved telling everyone his latest jokes and loved talking anyone that bakes into baking him some cookies. He is survived by his wife Trudy; children Luke and Adin; his parents; sister Candi Teeter; in-laws Donna and Raymond Burtch; sister-in-law Kay (Brian) Bamber; nieces Morgan, Jordan, Meghan, Kaci, Kendra and Kerry; nephew Austin; four great-nieces; six great nephews; many wonderful aunts, uncles, cousins, brothers from other mothers and believe it or not Duck and Jack, his cats that stole his heart. James was predeceased by his step-father James Vsetula, Uncle Stan Hazel, Aunt Jane Hazel, Uncle Royle Hazel and special friend Ron Mamerow. To send flowers or a remembrance gift to the family of James J. VanOver, please visit our Tribute Store. "Email Address" would like to share the life celebration of James J. VanOver. Click on the "link" to go to share a favorite memory or leave a condolence message for the family.